Puffed rice is washed under running water and kept aside to make it soft. Chopped spinach and onion are cooked in oil along with whole spices. Finally puffed rice is mixed in and finished with dalia powder. 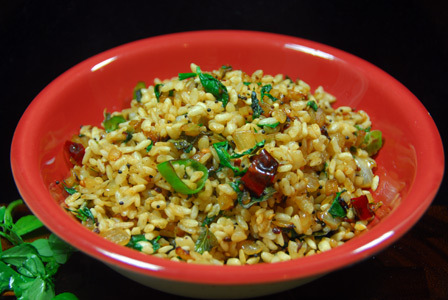 Serve spinach puffed rice upma as a breakfast or as a quick snack. Wash spinach thoroughly and finely chop it. Fry briefly, add green chillies, potato (if using) and onion. Fry for a minute or two till onion is translucent and potato turns soft and stir in spinach. Once the spinach wilts, stir in soaked puffed rice and salt. 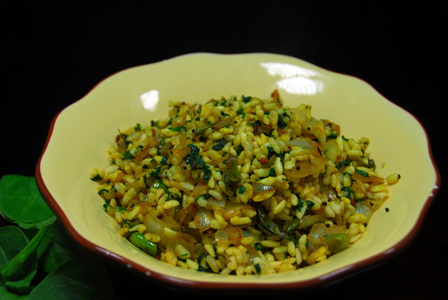 Stir in ground dalia powder and serve spinach puffed rice upma as a breakfast or as a snack. Other Names: Spinach Puffed Rice Upma, Palakura Maramarala Upma. Thick jaggery syrup is prepared with grated jaggery. Puffed rice is added to the jaggery syrup along with chopped cranberries and nuts. The mixture is pressed into squares and can be stored in a air tight container. Puffed rice squares stores for couple of months. 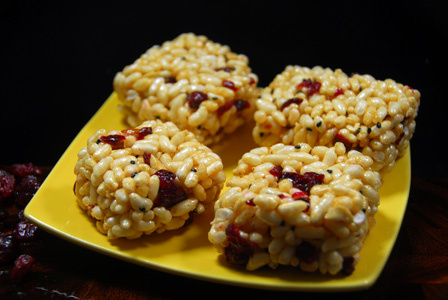 Makes: around 7 Puffed Rice Squares. Grease a square dish with half a tsp of ghee and keep aside. Slice the cashews and almonds. Toast the sesame seeds for a minute on low flame and keep aside. Heat half of ghee in a pan, add grated jaggery and few tablespoons of water. Let the jaggery melt and let the syrup thicken a bit. When the syrup forms a soft ball when dropped in a bowl of water, remove the pan from heat. Stir in puffed rice, chopped cranberries, cashews, almonds and sesame seeds. Mix thoroughly and remove the mixture onto the greased bowl. Press thoroughly and flatten the puffed rice mixture. When its warm enough to handle, divide the flattened mixture into 3 inch squares. Let it cool completely and store the puffed rice squares in a sealed jar and serve as desired. Notes: Make sure to get the jaggery syrup right. Suggestions: If puffed rice is not crisp enough, toast the puffed rice on low flame for a minute and cool to room temperature. Then add it to the jaggery syrup once crisped. Variations: Substitute cranberries with raisins or your choice of dried fruit. Other Names: Puffed Rice Squares. Puffed rice is soaked in water till soft. Chopped vegetables are cooked in oil along with whole spices. A freshly ground spice mixture is prepared and added to the pan. Finally puffed rice is mixed in and finished with cilantro. Serve masala puffed rice upma as a breakfast or as a quick snack. Remove stems, wash and finely chop the green chillies. Grind cloves, star anise and cinnamon into fine powder. When mustard seeds start spluttering, add green chillies, ground spice powder, potato and onion. Fry for a minute or two till onion is translucent and potato turns soft. Stir in peas, puffed rice and salt. 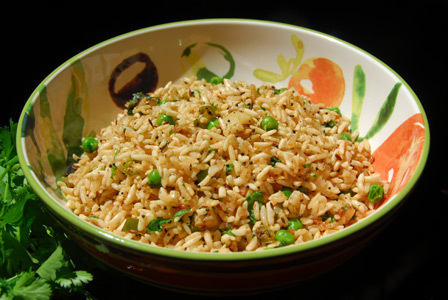 Stir in chopped cilantro and serve masala puffed rice upma as a breakfast or as a snack. Variations: You can also add finely chopped green bell pepper, carrots etc..
Other Names: Masala Puffed Rice Upma, Masala Maramarala Upma. Puffed rice, sev (deep fried besan noodles), corn chips etc are mixed with spices and freshly chopped vegetables for quick and easy bhel. 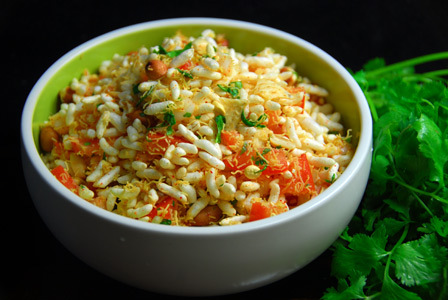 Serve easy bhel /puffed rice mixture immediately. Makes: around 2 Servings of Easy Bhel. Grind dalia, red chili powder and a pinch of salt into fine powder using a spice blender. In a mixing bowl, add puffed rice, fine sev, crushed corn chips, onion, tomato, green chile, roasted peanuts, ground dalia powder, lemon juice, cilantro and salt. Serve easy bhel /puffed rice mixture immediately. Notes: Make sure not to add chopped tomatoes and lemon juice until ready for serving. Suggestions: You can adjust the amount of each of the ingredients according to preference. Variations: Tortilla chips can be added to the bhel mixture.